Kitchens Are Monkey Business: Chimney Rock In Bayard, Nebraska. After leaving Scotts Bluff National Monument, the Hawthornes headed to Chimney Rock National Historic Site, 4 1/2 miles south of Bayard, Nebraska. Chimney rock is a famous, prominent geological rock formation in western Nebraska. The peak of Chimney Rock is 4226 feet above sea level. Based on paintings, sketches, and written accounts, Chimney Rock was taller when it was first seen by settlers, but has been reduced in height since then by erosion and a lightning strike in the 1990's. 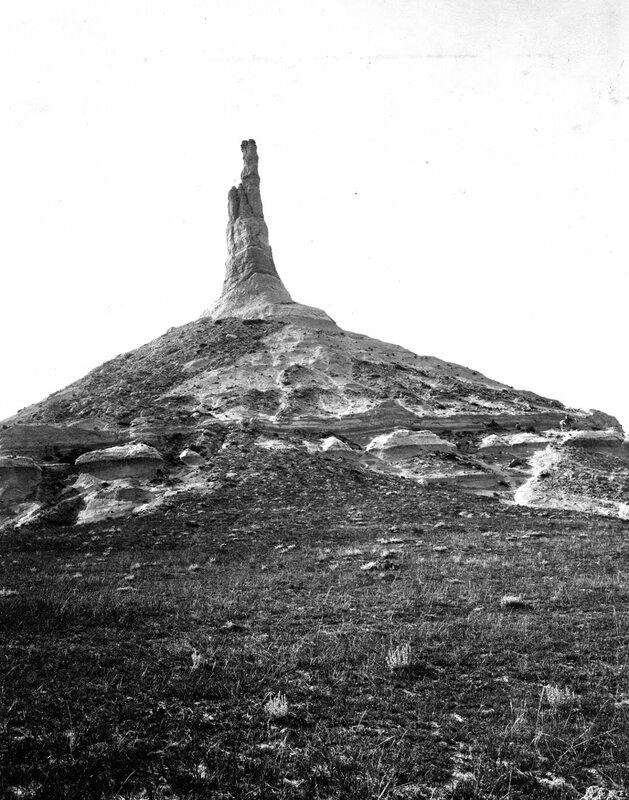 Here's an 1897 photograph of Chimney Rock by Nathaniel Darton. You can tell the difference in height from then and now. Chimney Rock is a historic Oregon, Morman, and California Trails landmark. It signaled the end of the prairies to westward bound pioneers. Chimney rock is estimated to be 325 feet tall, with a spire of 120 feet. I brought a few sunflower seeds home to plant next spring. Click to enlarge. Not far from Chimney Rock, two sabertooth tigers were found together, with one's tooth locked in the upper arm bone of the other. Both died in combat. This cemetery is off to the side of Chimney Rock. Chimney Rock Cemetery During the westward migration through this pass many died as they looked for a better life. "Wee Granny," Mary Murray Murdoch was one of them. Born in Scotland, October 13, 1782, she died near Chimney Rock, Nebraska, October 2, 1856. "Tell John I died with my face toward Zion." The Murdoch family dedicated the head stone June 24, 2001. Baby Boyer. Budded on earth to bloom in heaven. This harsh, unforgiving land took its toll on the early settlers. Not to make light of Mrs. Murdoch's death, but all those kids would have done me in. Wow, amazing photos Rosie, thanks for sharing! Great pics - but Chimney Rock is in Bayard, Nebraska. We are enjoying your trip tremendously. Lovely pics. Thanks for being our tour guide. It's amazing what the pioneers endured - all those kids (many of which probably died in childhood), building their homes with their bare hands, making the furnishings, making all their clothes, cooking with raw materials that they grew or killed themselves, all their worldly possessions in a wagon, and NO ELECTRICITY! Thanks, Anony #2. My bad. The problem is: We've been on the road for three weeks tomorrow. A different town every night. Except for three towns we stayed in for two nights: Nashville, Deadwood, and Kalispell. So, I really don't know what state I'm in half the time. We were in Montana for six nights. So if I get a state wrong, I apologize. Thank you so much for correcting me. For those who missed my error, my title of this post put Bayard in South Dakota, although the rest of the post correctly put it in Nebraska.